Not to be upstaged by the big Samsung announcement at this year’s MWC, Sony has also come through with its latest and greatest new smartphone – the Sony Xperia Z2. Another waterproof handset, it shares similar design traits to its predecessor, but in terms of both the hardware and software, the Japanese company looks to have been hard at work. I got a chance to spend a few minutes with the device in Barcelona, and as well as a hands-on video below, I’ll be letting you know what I think of this most recent addition to the Xperia family, and moreover, whether it can serve as a genuine competitor to the Samsung Galaxy S5. The design of the Sony Xperia Z2 is very much in-keeping with tradition. Like it or loathe it, the glass front-and-back combination stays, and the whole thing is rather nicely finished off by a single piece of aluminum around the edge. To hold, the Xperia Z2 feels substantial, like a premium product, but if you have used Xperia devices in the past, then you’re not getting too much by way of newness here. Everything is familiar, with Sony seemingly proud of the look and feel it has honed and refined, and while it does, aesthetically at least, make an impression, it’s certainly not revolutionary. The Galaxy S5 in contrast sports a familiar plastic look, and while reaction has been rather mixed to Samsung’s latest and greatest in general, the inclusion of the gold model could be a real winner for the Korean outfit if it can muster the kind of sales Apple has managed with the champagne-tinted iPhone 5s. Z2’s display really is something to marvel. A 5.2-inch affair, it packs 423 pixels-per-inch, and while this may seem like a drop from the Xperia Z1’s 440ppi, there’s no doubt that with this newer model, you’re getting a much, much better display. The Xperia range has often been criticized for its shortcomings as far as the display is concerned, but few would be able to make a case against the panel of the Z2. It’s stunningly bright, vibrant, and the viewing angles really are something to treasure. If you’re a movie or gaming fan, then you’ll be able to take full advantage of what Sony has laid on here, and similarly, with 4K recording – which we will discuss in more detail below – the Z2 brings that perfect combination of great camera and a display to match. The Samsung Galaxy S5 sports a 5.1-inch Full-HD Super AMOLED panel, so both of these new devices are equipped with very workable displays. The rear-facing 20.7-megapixel shooter is, without a doubt, one of the best in the market. At Mobile World Congress, I saw dozens of great snaps shot on the likes of the Nokia Lumia 925, Lumia 1520 and of course, the Lumia 1020, and while I wouldn’t want to challenge the DSLR-like credentials of the latter, this is easily the best camera I’ve seen in a non-Nokia device. The detail is terrific, and although we cannot verify its low-light performance given that the Sony booth was quite possibly the most brightly-lit at MWC, the Xperia Z2’s camera is a joy to use. With 4K recording also on the agenda, Sony’s newest toy is every bit a match for the new camera tech of the Galaxy S5, and whichever device you decide on picking up, it’s safe to say that you’ll be well looked after when trying to shoot movies and take snaps. You get your usual array of Sony-focused apps atop the stock Android experience, but it’s nothing too heavy. With the Xperia Z2, you get a very Nexus-like, almost untouched set-up, and while some folks are partial to the TouchWiz overlay that Samsung always offers, the Xperia Z2’s software arrangement is still more than capable of fulfilling the needs of the high-end smartphone user. This is, I feel, a make-or-break area for Sony. There’s no doubt that the Xperia Z2 has been built for the snap-happy generation, but there is nothing really new here. Sure, Samsung’s grandiose spread of a heart rate monitor and other such niceties are niche, but with the Xperia Z2’s waterproof USP out of the window now that the Galaxy S5 can also be used in the shower, although Z2 can go deeper in water, those on the fence may look towards some of the arguably gimmicky features and lean towards the Galaxy S5. We, as tech fans, know that Samsung hasn’t brought a lot to the table with the Galaxy S5. Evolutionary rather than revolutionary, it’s a similar bump to that of the S4 from the S3, and those who’ve developed a sense of apathy towards these rather lazy upgrades could be looking at other Android handsets as a way of branching away from the same old rhetoric. Unfortunately, though, while I do like the Xperia Z2 smartphone, Sony has arguably pulled the same tactic as Samsung, and in effect, missed an opportunity to capitalize. The Xperia Z2 is a slightly-better-than-modest bump from the Z1, and while smartphones don’t require an annual overhaul, those, like Sony, in the rather unflattering category of “also-rans,” should be coming with some killer features. Don’t get me wrong – it is a good smartphone with nifty features, and the camera / display are top-notch. But when you’re talking about a year of progress, there’s just not enough here to be getting excited about. 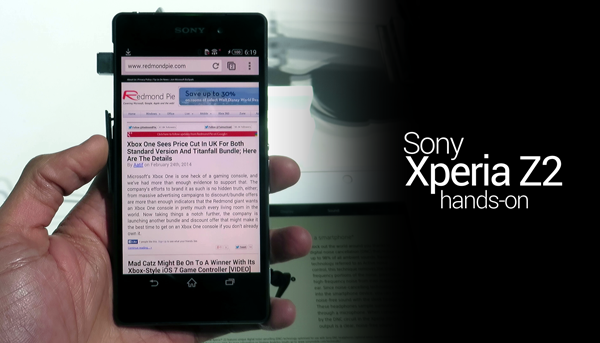 Overall, I would give the Sony Xperia Z2 a 7.5 /10 rating. Premium feel to body, unlike on Galaxy S5. The rear-facing camera is awesome. Zippy, largely untouched Android experience. Waterproof with rating IP58 vs Water-resistant on Galaxy S5 with rating IP67. Glass on front and back maybe prone to blemish. Severely lacking a killer feature.